The WCRI Annual Issues and Research Conference gets underway a week from today in Boston. The conference and Lynch Ryan are each in their 31st year, but, truth to tell, the first WCRI conference could have been held in a telephone booth (not The Tardis). We wrote about this conference a couple of weeks ago, so no need to cover old ground. However, it is worthwhile to mention how valuable the conference has become. It’s a serious event attended by serious professionals. Sorry- not much partying. Las Vegas it aint. And this year its style is even more cramped what with more than eight feet of snow hanging around. But the walkway around the Charles is cleared, so you can bring your running shoes. I, on the other hand, coffee in hand, will be happy to wave goodbye to you as you head out the hotel door for that morning run. The older I get the more I subscribe to Winston Churhill’s view of exercise: he said he got enough of it carrying the coffins of his athletic friends. Unfortunately, we just learned that the WCRI has “reluctantly” decided to cancel its Opt Out session, because “at least one of the presenters felt that the time allotted for the session was too short for the objectives to be well-met.” This is truly unfortunate given the momentum the Opt Out movement is gaining nationally. You would have thought the presenters could have raised this issue a lot earlier. Nonetheless, I’m sure there will be much opt out discussion among attendees outside of the sessions. WCRI is offering to refund registration money for those who choose to “opt out” of Boston due to the cancellation. Regardless, I hope to see you in Boston. A Southern California applicants’ law firm claims in court filings that Knox Ricksen “hacked” the computer network of a vendor it uses to sign up new clients to gain access to an estimated 2,000 confidential and privileged documents. In the suit, the plainiffs’ law firm, Reyes & Barsoum, says it has a vendor, HQ Sign-up Services Inc., whose job it is to “sign up” customers for the firm. The suit alleges that the defense law firm Knox Ricksen hacked HQ Sign-up, gaining access to claimant information which HQ Sign-up would forward to lawyers at Reyes & Barsoum. This would give Knox Ricksenan unfair and illegal advantage in the legal proceedings. People, I did not title this Inside Baseball for nothing! This little dust-up shines a light on the dog-eat-dog adjuducative business that is California workers’ comp. It’s not pretty and it never has been. I wonder what opt out legislation would do for California? Now we balance the cesspool into which California’s workers’ comp courtroom wars sometimes descend with workers’ comp law as it should be practiced. John Geaney, a man for whom I have great respect, is an executive committee member and shareholder with New Jersey’s Capehart Scatchard. John began publishing a client newsletter in 2001. 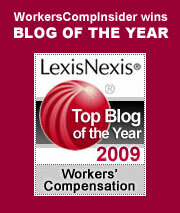 A few years ago it morphed into a blog, which Lexis Nexus awards as one the nation’s Top 25 workers’ comp blogs. John’s blog should be required reading for all workers’ comp professionals in New Jersey. For that matter, it’s instructive wherever you are. Today’s blog post concerns the right of injured workers to have access to their medical files. In my experience, there are some claims adjusters that resist this. However, doing so can worsen the situation and alienate the injured worker. Transparency is good for everyone. This blog post is well worth reading. In his Quick Tips blog post of today, Barry Thompson takes no prisoners as he derides what has become of “Managed Care,” which Barry has renamed “Manipulated Cost.” His is a tale told in anger, and he asks, “Where’s the outrage?” Good question. In the early 1990s, I gave a presentation at NCCI’s Annual Issues Conference and titled the presentation Managed Care: Who Manages, Who Cares? ‘Twas ever thus. It seems that the question is still begging for an answer. And we all remember those “death panels,” too, don’t we? Go here to see the seven different components and the many questions WCRI speakers and panels will try to address. And go here for hotel registration information. WCRI has negotiated a $159 per night room cost. And speaking as a Boston “Homey,” I can tell you that the Park Plaza is a very nice place. I look forward to high level dialogue and debate. Most of workers comp’s smartest and best informed people will be there. Will you be among them?